A few weeks ago Ant informed me of his affinity for these popular coffee chain muffins. I decided it would be rather nice of me to try to replicate them, so that he could grab one straight from the freezer whenever the craving struck. It’s true. I don’t drink coffee in any form, so I have no need to frequent the Dunkin-Cosi-Bucks of the world. Because of this, I have never had one of the mentioned muffins and had no idea what the heck I was making! In my own defense, I did try this recipe first in hopes that it would be “close enough”, but was quickly informed that this version was “really good, but not quite cream cheesy enough”. To make it simpler lets start with the “cake” part of the muffin (batter 1 & batter 2). 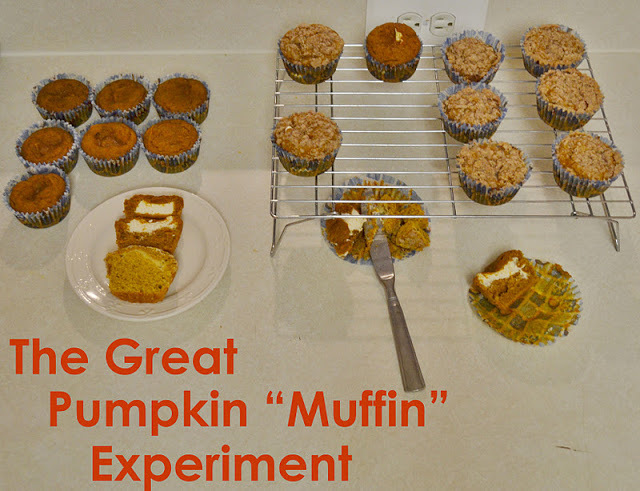 Muffins A and B are made with batter 2, the denser and slightly more “pumpkin flavored” version. Filling B is cream cheese mixed with a splash of vanilla and a bit of powdered sugar. (I like to refer to it as Fluff.) This one didn’t have exact amounts because I was kinda just throwing things together in order to get the right flavor, but if I had to guess I’d say 8oz cream cheese + 1/4 c. powdered sugar + 1/2 tsp. vanilla. You can easily adjust the amounts according to your personal tastes. Filling C didn’t seem to hold up as well as the other two. It may have had something to do with the fact that there was brown sugar and an egg mixed into the cream cheese. This was part of the recipe for batter 1 above. and then added the streusel topping that goes with batter 1.
then it is better to use batter 2 with filling 2. Confused? I was too, but one thing that makes these muffins easier no matter the recipe is using ziploc bags to fill the muffin cups. Fill one with the pumpkin and another with the filling. Then you can put a small amount of batter to form a little well in each cup, squeeze the cream cheese into the well, and then cover everything with a small amount of pumpkin. 1. Preheat oven to 375 degrees F (190 degrees C). Grease and flour 20 muffin cups, or use paper liners. 2. To make the filling: In a medium bowl, beat cream cheese until soft. Add vanilla and sugar. Beat until smooth, then set aside. 3. For the streusel topping: In a medium bowl, mix flour, sugar, and cinnamon. Add butter and cut it in with a fork until crumbly. Set aside. 6.Bake at 375 degrees F (195 degrees C) for 20 to 25 minutes. Have any of you ever gone through this much trouble for a special recipe? Wow…what an angel and a loving wife you are. Thanks for all the time and experimenting that you did for all of us. Yes, I will try your recipe. I want to share an easy, low cal recipe. 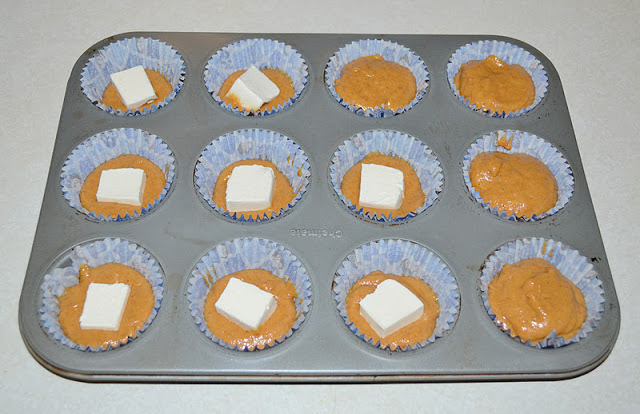 Use one box of cake mix, I love the spice or carrot cake mix, add i small can of pumpkin. That's it. It is very heavy and mosit but taste delicious and only 2 WW points so I know it is not too sinful. Enjoy and congratulations on becoming a mom. Pamper yourself!! Dang, girl. If Ant is ever giving you a hard time about something show him this post!! He's a lucky guy! I can't say that I've ever done this kind of recipe testing. I usually just read other people's reviews on recipes. You know, let them do all the hard work for me 😉 IT looks tasty – I love anything pumpkin. Saw this at Tator Tots and Jello. They look delicious. I love anything with pumpkin. I am putting a stash up in my pantry, you can't find pumpkin after winter in the stores around here. Hope you will visit overy at Suppers, Youngans, & Thangs sometime. Yummy!!!! All of these look good!!! I love anything with cream cheese! Thanks for sharing!